Ever since we first met Lenovo's ThinkPad X100e at CES we've had it on a virtual pedestal as the perfect solution between a netbook and a larger 13- or 14-inch ULV ultraportable. That's because in addition to carrying the renowned ThinkPad brand, its AMD Neo processor / ATI graphics combo promise more power than the typical Intel Atom N450-powered netbook, and with an 11.6-inch screen the chassis can accommodate a wider keyboard and touchpad. Sounds like the perfect mobile computer, right? Unfortunately, there are two things that hold the $549 X100e from being all we wanted it be. Thought we were going to give it up that easily? Pssh. Hit that read more link for the full review. 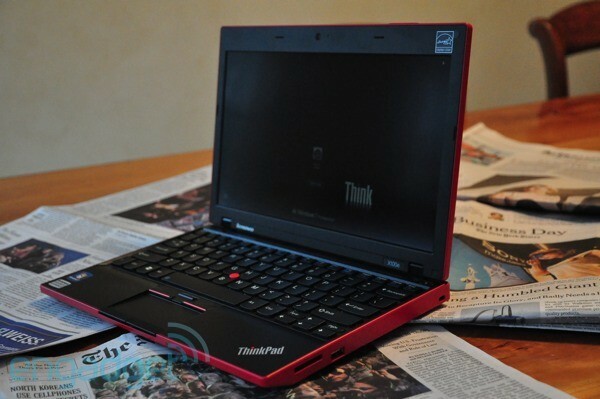 How would you rate the ThinkPad X100e? Unlike the new Edge series, the X100e's angular edges and boxy build scream traditional ThinkPad design, and as part of the X Series family it looks more like a shrunken X201 or X301 more than anything else. 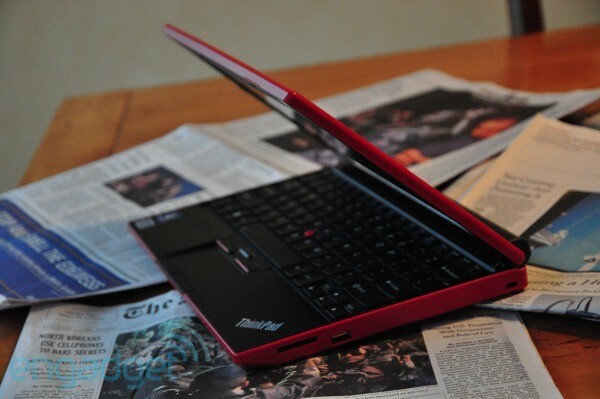 Yet despite its strong ThinkPad design heritage, the "heatwave red" color of our unit is a dead giveaway of Lenovo's motivation to go after a bit more of the rebellious (or you know, Valentine's Day loving) mobile professional. Cherry red haters are not to worry, you can also nab it in the familiar matte black. Lenovo refuses to call the X100e a netbook, but we're going to call a spade a spade and say that size-wise that's exactly what it looks like. The inch-thick laptop is slightly longer than 10-inch netbooks, but it's still compact enough to fit into a small handbag and carry in one hand. Our one qualm about the entire design comes with the six-cell battery, which protrudes out of the X100e's rear – not only is it awkward, but it puts the system at 3.3 pounds. That's just too heavy for something this small, and oddly enough the larger, 12-inch X201 feels noticeably lighter in comparison. Three USB ports, VGA, Ethernet, a mic jack and an SD card slot surround the chassis. 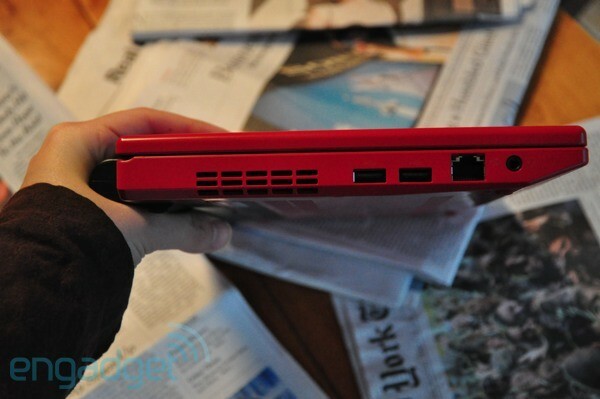 Lenovo, still refusing to call it a netbook? Riiight. You know the feeling after you've had a great meal and you just can't wait to go back and for more? That's the only way we know how to describe our feelings about the spill-resistant, chiclet keyboard on the X100e (which is the same as that on the Edge 13). The black, matte curved keys – Lenovo calls them "keycaped" – feel as if they've been molded especially for our finger tips, and the entire panel is void of any flex or bounce. While the function buttons have been shrunken down, there are two full sized Shift keys and we didn't have to make any adjustments to our usual hand positioning when typing this review. 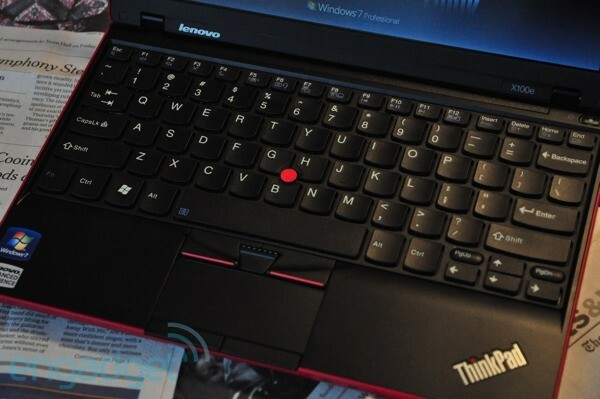 Like most Lenovo ThinkPads you'll never be at a loss for navigation options – there's the signature red TrackPoint in the middle of the keyboard and a smaller touchpad below. We're pointing stick people, but the touchpad is decently sized, though its multitouch capabilities are finicky. Truth is we've navigated and typed on a lot of netbooks and small computers, and there's no doubt in our minds that the experience on the X100e is the top of the game. Unsurprisingly, we prefer the X100e's matte 11.6-inch, 1366 x 768-resolution screen to that of 10-inch netbook displays. It was sufficiently bright when we watched an 1080p Alice In Wonderland clip, but when we tilted the screen back colors were quick to fade. Horizontal viewing angles were also narrow, but were adequate for sharing the screen with a family member. Like on the Edge 13, above the display is a low-light webcam, which displayed our face fairly clearly during a video call in a dark room. You hear that? It's the sound of Chatrouletters rejoicing! The speakers located on the front lip of the laptop produce decently loud sound for a system this size, though Lady Gaga's Telephone sounded fairly tinny at full blast. The X100e is the first ever ThinkPad to be powered by an AMD processor, and also one of the first ultraportables we've reviewed with the company's single-core 1.6Ghz Athlon Neo MV-40. Coupled with 2GB of RAM and a 5,400rpm 250GB hard drive the X100e was snappy when surfing the web, writing this review in Microsoft Word 2007 and listening to some tunes in Windows Media Player. In comparison to Atom netbooks, it felt slightly faster when opening programs and toggling between applications, but slightly behind ULV laptops we've tested. Graphics-wise the X100e's ATI Radeon HD 3200 integrated GPU helps it boast better HD performance than most Atom netbooks. Out of the box we had no problems streaming 720p YouTube videos, and upgrading to Flash 10.1 pushed 1080p content along with very few pauses. Obviously when it comes to gaming the X100e doesn't fall anywhere close to the NVIDIA GT335M-powered Alienware M11x, but it did handle World of Warcraft at a decent 25fps. However while we were enjoying the multimedia boost, we noticed the bottom of the laptop getting increasingly hot. While the keyboard and touchpad stayed fairly cool, the left edge and the underside of the system created a very toasty spot on our jeans. We're inclined to blame AMD's Neo considering the HP dv2 showed similar lap-burning temperatures. Yes, AMD's Athlon Neo gives the X100e a noticeable performance and graphics boost over the typical Intel Atom processor and even some lower end Celeron ULV processors, but when it comes to battery life it destroys the ThinkPad's chance of running with the gassed up Intel-powered lappies. On our video rundown test the X100e's 63Wh, six-cell battery lasted a pretty sad three and a half hours. Most netbooks with six-cell batteries run for double that time, and most ULV laptops last over four and a half hours. We don't even want to know how long the three-cell battery lasts on a charge, but there's the answer to why Lenovo only offers the X100e with six-cell battery options on its site. We know it's taken AMD a while to really get into the "netbook" or low cost ultraportable space, but its Neo processor is just too hot and energy hungry. We're not sure pushing a dual-core version of this processor out the door is the answer -- AMD just isn't playing on the same level as Intel when it comes to low-power CPUs, and the X100e unfortunately demonstrates that all too clearly. 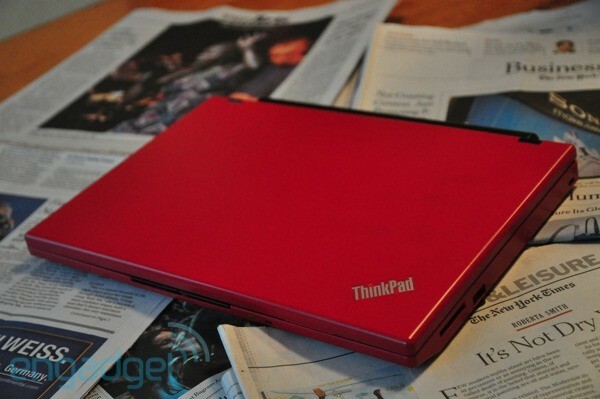 Photography note: the ThinkPad x100e is housebroken, we just didn't like the red on cherry wood color combination.